An indie video game about city planning and deck-building! 1,547 backers pledged £13,870 to help bring this project to life. Thanks to the incredible support of the backers, the game is over 450% funded and greenlit! Also I want to thank the games press for giving this little project some coverage- especially Rock Paper Shotgun and Kotaku. A mock-up image of 'night mode', one of the stretch goals now reached! Concrete Jungle is a new take on the city building game that swaps micro management for deck-building and extra servings of strategy. and the variety and depth of a collectible card game. Topped with the isometric stylings of classic 90s management sims! You use cards in your deck to place buildings, clearing city blocks to give yourself more room to build. As your city grows you'll get opportunities to hone your deck, but the game also gets harder. It started off years ago as a sequel to my indie game 'MegaCity' from 2011. Although still a successor to that game, it's come so far I thought it had earned a shiny new name. The game is being developed for PC but I'll also be porting to Mac. Ports to Linux, Android and iOS may also be possible further down the road. You have a deck of selected cards which you can use to place buildings. Each building will affect it's surroundings in different ways. The aim of the game is to clear city blocks by gathering the required number of points from your residents, giving more room to build. As the city grows, you choose bigger and better new buildings to add to your deck! As you get opportunities to hone and refine your deck, residents will demand more from you, making the game harder. You'll find yourself inadvertently creating zoning puzzles- playing against your own past planning decisions! Also in the works is a competitive game mode where 2 rival city planners face off in a city planning dual. Incredibly tactical- your building placements and deck building skills matter more than ever here. Is their new apartment building raking in tonnes of points? Place a landfill next to it to screw them over! It's like building a city through playing chess- if chess was much, much meaner. There will also be AI to play against in this mode. The game does not feature free-to-play mechanics or micro-transactions. There will be plenty of unlocks, but you'll have to earn them! Over 150+ buildings! 50 more in a free update after release. Single player story mode with 6 unlockable characters! 2 more in a free update after release. Voice acting for the characters! Competitive mode with challenging AI! Soundtrack featuring DP Kaufman, Mokhov & Xerxes and original music. A night time mode- see your city lights at night! (Will also be in the free update). 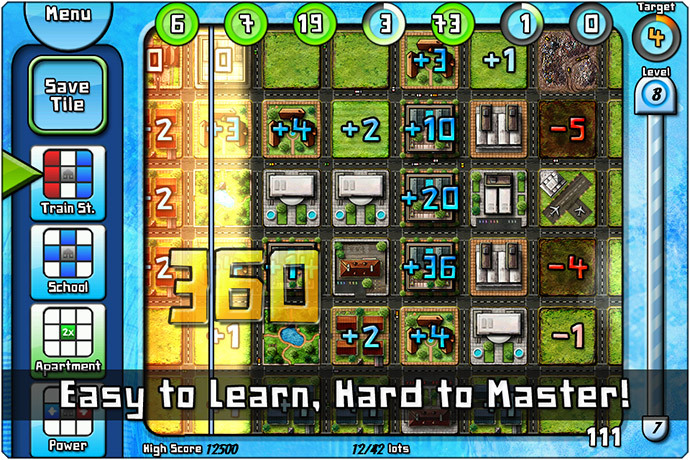 Combo buildings together for maximum points. Build your deck as you build the city! Although I have a functioning build I'm really happy with, it only represents the beginning of what I want this project to be. As the sole developer and artist, I can operate for next-to-nothing (but not quite nothing). The kickstarter funding will secure me enough time to implement the features listed above, as well as provide enough money to license the ideal soundtrack for the project. I've organized the project for minimal risk- all the game mechanics are in place- what's left to do is add content and balance. Both of which are time consuming, but also in the grand scheme of things, relatively straightforward. That's not to under-estimate the challenges up ahead, but I'm fully confident I can deliver on this! Early access funding is/was another potential route. However, as a gamer myself, I'm a little wary of this model. I feel it diminishes the release of the actual finished game- it's hard to keep track of a game when there's more than 1 release date! Offering a preview build in a kickstarter campaign is a great comprise as it's limited enough to not deaden the final product, while giving you guys something cool to play in return for supporting the project. The preview version of the game is already completely playable on PC and features 44 buildings. It's what I'm using to demo the game. You can get it right away after the kickstarter ends, along with a copy of the full game on release if you pledge just £5 or more! The other backer rewards are filled with ways you can actually be in the game! There will be a large pool of random building names which will be assigned to every building each game. To add your name to the building databases, choose one of the pledges detailed on the right. An example of your building names in the game! The next is the city building database, which is unique for every other building. I'll sort out your submitted name into the correct category. For example, you could submit 'Frank's Firework Factory' and I'll make sure it only applies to factories. Or have a hospital named after you, eg 'Franklin's Hospital for Severe Burns'. There is also a neighborhood database. In the game this applies to a group of buildings- real life examples would be the neighborhoods of SoHo or Tribeca in New York. This could be pretty much anything. 'The Firework District'. Lastly, there's also a database for landmarks, which are top-end buildings. Think of them as statues or monuments. Eg 'The Frank Callahan Memorial'. For the top tier rewards, I will get in touch with you to create your buildings/character! I reserve the final say over what makes it in, but if I have a problem with your submission I'll get in contact to request a new one from you or suggest alternatives. I'm going to ask we avoid blatant advertising, submissions of bad taste etc. Names are fine. Puns are encouraged! The campaign has had an incredible response! So much so that we're already funded & greenlit! So what now? I asked the backers to vote on how the extra funds should be used (if you're a backer, check update #4), and the favorites were expansion of the game (more buildings and characters) and more visual effects (night mode, weather etc). So I'm going to be putting the extra funding towards those- details further below. I've also had a lot of advice relating to stretch goals- adding more content inevitably takes more time. I want to do what I can to meet my original planned release date and get a finished project out there for you. So my plan is to complete the game to the standard above, release it, then use the extra funds to expand it for free. I'm also going to be using some of the money to hire people to help with the workload in the meantime. This is the best of both worlds as you guys will get the game on time, and you'll get the extra content later on for no cost! +50 more buildings! Every time we break a new £500 barrier from 8k onwards, I'll add another 5! (I'm going to have to cap it at 50 though folks, I'm running out of building ideas!) GOAL REACHED! +Night mode! It's a nice visual change, and it just looks cool! It's something I've wanted to include since the start but involves a lot of work as each building will have to have a 'night time look' created for it. I've done a quick mock-up of how I want it to look above. GOAL REACHED! +Other VFX: I'm going to look into doing some rain effects, and I'd like to get some people on the streets. The only thing stopping me from promising this right now is I'm not sure how it will impact performance on the engine I'm using. Will do this if possible! +Language support: I'm already going to put some of the extra money to making sure the game supports some other languages. Details will be confirmed towards release. French, Spanish & German at the minimum. +Expanded soundtrack: As well as the aforementioned licensed tracks, I'll also be adding some original music to the game in the form of a 'main theme'. Guaranteed @ 11k! +Voice acting: I think this could be really cool (especially for a tutorial and the story mode). Consider it guaranteed if we pass 12k! If you are a member of the press, you can find a presskit here. I want you to be able to back my project with confidence. That's why I've minimized potential risk by holding off on launching this campaign until I had a preview version playable and ready. I want to give you something to play now that's worth your money in its current state and will only get better towards release. It's not just a promise of a project- there's a lot here to play already. I've also tried to make the funding goal as reasonable as possible. I'm able do this because I'm the sole developer, and there are very few additional costs- the main one being music licensing. I've currently got a release penciled in for May 2015. It's possible that the project will be completed before then if everything goes smoothly, but I'm trying to plan for everything. As a backer, you will be notified of any delays or hiccups. Along the way I'll be sharing with you as much of the development process as possible. I'll be writing dev blogs and improving the game with your feedback throughout the rest of the project. There are forums set up at colepowered.com for your input. Thanks for reading! I hope I've shown you enough to earn your support. I can't wait to get started on the rest of this project! Every backer will be listed in the game's credits for making the project possible! FOUNDING RESIDENT TIER • Digital copy of the game on release, plus a steam key (pending greenlight success). You'll also be sent the preview build as soon as the kickstarter campaign finishes! RESIDENT TIER • Digital copy of the game on release, plus a steam key (pending greenlight success). You'll also be sent the preview build as soon as the kickstarter campaign finishes! LANDLORD TIER • A digital copy of the game as above, and the preview build. ALSO, you'll get your name added to the game's citizen database- when a player clicks on a house in-game, you could be living there! BUSINESS TYCOON TIER • A digital copy of the game as above, the preview build, your name in the citizen database. PLUS your made-up building name of choice will be added to the game's building name database! URBAN LEGEND TIER • A digital copy of the game as above, the preview build, your name in the citizen database and the building database. PLUS get your made-up neighborhood name also featured in the game! When a player clicks on a neighborhood, it could be named by you! LANDMARK TIER • A digital copy of the game as above, the preview build, your name in the citizen database, building database & neighborhood database. You'll also join the elite ranks and get to submit a name into the landmark (top-tier building) database. MAYOR TIER • A digital copy of the game as above, the preview build, AND UP TO 10 NAMES in the citizen database, the building database, the neighborhood database & landmark database! ARCHITECT TIER • A digital copy of the game as above and the preview build. Not only will your 10 names of choice be featured in the aforementioned databases, I'll create a building of your own design to go in the game! WOW! SUPER DUPER URBAN PLANNING GOD TIER • You'll get EVERYTHING above, but I'll also design either yourself or character of choice as an unlockable playable character in-game!